Has IT and Pennywise made you hungry for McDonalds? We didn't think so. In fact, it's probably kept you out of the McDonalds' drive-through for the past couple of weeks, if anything else. Well, Burger King Russia thinks otherwise. They are demanding a ban on IT in their country, because they believe the movie will have everyone flocking to their competitor. Because Pennywise looks too much like Ronald McDonald. Yes, you heard that right. You'd think Burger King Russia would be dancing in the streets over IT and its look-a-like dancing clown, as it should be sending terrified costumers away from McDonalds, not towards those golden arches. But we digress. The Russian division of Burger King has filed a complain with the Russian Federal anti-monopoly service. They are straight out demanding that IT be banned from Russia. Not because the content of the movie is too scary for Russian audiences mind you. They think Pennywise looks so much like Ronald McDonald that the entire movie serves as one giant advertisement for McDonalds Restaurants, giving the rival fast food chain a leg up. Do they not realize that Pennywise eats children? Perhaps not. A spokesperson for the FAS has confirmed that Burger King sure as heck filed a complaint. And that complaint is currently being evaluated. The spokesperson had this to say. "We can't be concerned with the content of the film because the writer and director have their own creative understanding of any character." The goal isn't to decide if the content is not worthy of viewing itself. The FAS is studying the film to see if there are any blatant advertisements that would have hungry moviegoers heading to McDonalds as opposed to Burger King after they watch it, or if there is any blatant product placement that is outside of the norm. Which, if my own memory serves me correct, there isn't. There is no time frame given for considering this complaint. Burger King is said to be actively expanding its reach inside Russia. And they have been aggressively pushing new and different fast food ideas within the country. Burger King Russia came under its own bit of controversy lately when it issued its own 'crypto currency', not unlike bitcoin, that is called WhopperCoin. At this time, crypto currency is not allowed in Russia. And it's unclear if WhopperCoin will be given a pass. IT is doing strong business in Russia, having opened several weeks ago on September 7, so Burger King Russia's call for a ban hasn't really gone anywhere. The movie has grossed $14 million in Russia alone. As of this Tuesday, the movie was still playing in 100 theaters throughout Russia. 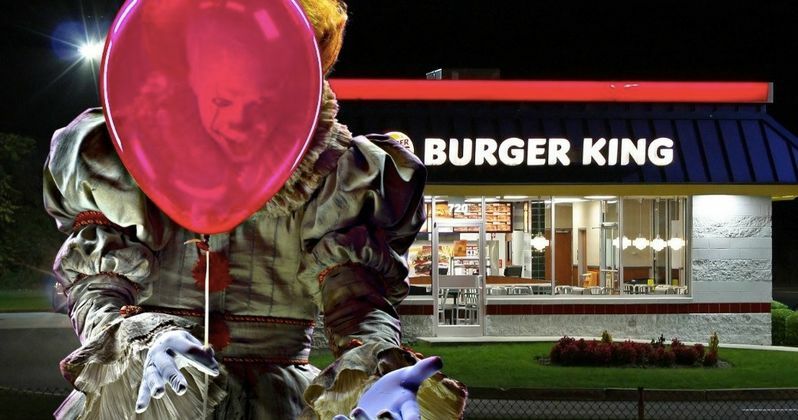 Russian social media believe the proposed ban is ridiculous, with one Facebook user claiming that the head of Burger King Russia should have played Pennywise. It's doubtful that any type of ban will be placed on IT in Russia anytime soon, and definitely not while it is currently playing in theaters, heading into its fourth weekend of release.